In this week's entry we'll look at two more "live" CDs of Linux systems optimized for multimedia creation and performance. I've been having a great time with these systems, and I hope that my mini-profiles inspire you to try them all. They're a great way to introduce someone to Linux, they show off the system optimized for multimedia performance and they provide a wealth of high-quality sound and music software to exploit that system. They all include the standard cornucopia of applications for the mundane tasks, word processing, text editing, graphics, networking, and so on. All that, for the cost of a download and a disc. Marcos Guglielmetti's Musix is based upon the Knoppix distribution. The underlying system has been enhanced with the usual optimizations, but Musix is the only system I encountered that specifically offers the user a choice between a normal kernel (2.6.16) and one optimized for realtime multimedia performance (2.6.15-rt). That's a nice touch. When you reach the Musix boot prompt, select your kernel and language preferences, press Enter, and let Musix take over. Once again hardware detection was perfect, but the system configured only my M-Audio card by default, and networking was disabled. I'll return to those issues (and their resolution) in a moment. The IceWM window manager is the default desktop, but you can switch it to KDE if you have sufficient resources. By the way, note the row of boxes at the bottom of the screenshot in Figure 1. Each icon represents a group of applications, including a General group and others for audio/MIDI apps, Internet-related programs and utilities, tools for administrative tasks, office-oriented software, etc. Click on an icon, and the screen changes with a new background image and a new set of program icons and folders. I liked this method of organizing the system, it invited experimentation and play. Musix does offer Fluxbox as a desktop alternative, but selecting it killed the X server. Oh well, I was quite happy with IceWM. Okay, about my soundcards and network connection. The Musix Controls dialog (in the Admin group) includes an option for installing dual cards, but for some reason the internationalization didn't take effect. Fortunately I could figure out what the Portuguese meant, and within a few minutes my M-Audio and SBLive cards were perfectly configured and ready for use. By the way, Musix's default settings for JACK were good, but once again I lowered values to achieve very low latency. Next I used the system's netconfig utility to set up eth0 for DHCP, and voila, I had my Internet connection. On to the tests. After setting up JACK to my specifications I clicked on the Ardour icon in the Audio applications group. Within seconds I was running Ardour 0.99.3, and all was well with it. I recorded some junk tracks, everything seemed to be in full working order, so I moved on to Rosegarden. When I clicked on the Rosegarden icon I thought something had gone wrong. Instead of seeing the familiar Rosegarden splash I saw a list of what turned out to be scripts for launching Rosegarden pre-configured for various combinations of JACK or ALSA with DSSI synths, ZynAddSubFX, QSynth, Hydrogen, and TiMidity. I thought that was pretty cool, then I discovered that Marcos Guglielmetti had also prepared a unique demo for each script. I didn't try every configuration, but the demos for the ones I did try were musically solid and certainly ought to entice any listener into wondering how he or she could do something like that with these tools. 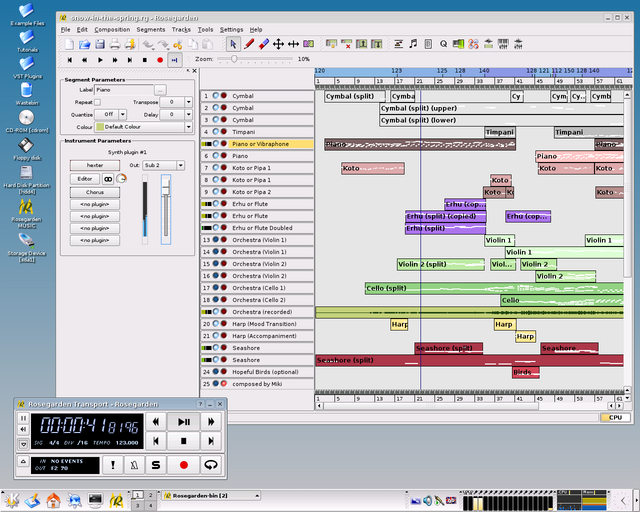 Musix provides a healthy selection of applications for sound and music, including some not commonly encountered even in similar systems, such as Traverso (hard-disk recorder), Tartini (realtime music analysis), and BEAST (sound synthesis and music composition). I have no reservations about recommending Musix. It's obviously a labor of love, and I look forward to enjoying its evolution. You should try it, you might like it. And while you're trying it, be sure to check out Marcos's "Zyn-techno" demo for Rosegarden combined with the ZynAddSubFX synthesizer. It's a sweet groove, just like Musix itself. Added 4 October 2006: A fine interview with Marcos Guglielmetti can be read at DCZX's excellent Linux Rock Star blog. Fervent Software's Studio To Go differs significantly from the other live systems I've reviewed here. First, it's a commercial product, complete with shrink-wrapped box, manual, and physical disc (or you can purchase a downloadable edition and burn your own disc). Second, it's built by the creators of Rosegarden, the finest audio/MIDI sequencer for Linux, hence Studio To Go is designed and optimized with a Rosegarden-centric focus. Finally, Studio To Go provides only the KDE desktop, assuming a somewhat higher level for base hardware specification (a 1.2 GHz or higher CPU is recommended). Before addressing these differences I'll briefly discuss Studio To Go's similarities to the other live systems I've profiled. Its start-up procedures and options include selections for video resolution, kernel version, and language, along with a unique set of boot parameters favorable to laptop and notebook computers. Hardware detection breezed by, and both soundcards were configured without problems. Networking was set up as in Musix: I ran the network configurator, set eth0 for DHCP connection, and boom, I'm on-line. Studio To Go's general-purpose software map includes the expected (and up-to-date) office and networking applications, and its sound and music applications base reflects the state of contemporary Linux audio. All the major players are here, including the newly-minted Rosegarden 1.4 (a downloadable version is available for users of Studio To Go 1.0 and 1.5) and the latest versions of Ardour and Hydrogen. 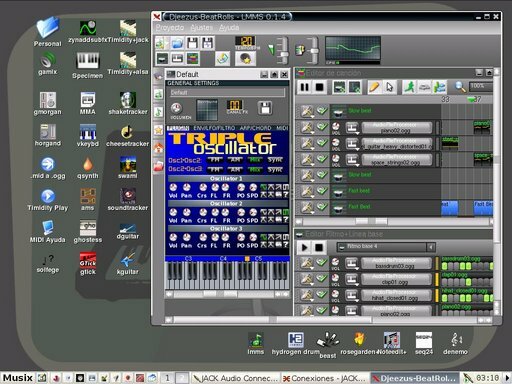 LADSPA and DSSI processors and synthesizers are supported, of course, but Studio To Go also provides explicit support for VST/VSTi plugins. The distribution even includes some free-as-in-libre VST plugins for your immediate enjoyment. Cool. So, back to those differences. The simple question is, "Is it worth purchasing ? ", and my simple answer is, "Absolutely." The more complicated answer devolves upon what I'll call polish. Each system I've reviewed here is a sophisticated creation, well-crafted and a pleasure to explore. Studio To Go is likewise, but with an extra measure of attention in matters of presentation and documentation. For example, when the demo starts the user can choose to run an animated demonstration of Rosegarden's music notation capabilities. The demonstration ends with the music still playing, and you can decide to stop playback or let it continue while you continue to explore the system. It's a nice touch, maybe non-essential, but it shows that the developers have thought about making the user's experience pleasurable and productive. The KDE 3.3 desktop is certainly one reason Studio To Go looks so good. I haven't spent time with KDE for a long while, and I must say that I was impressed with how it's evolved. It even performed decently on my under-powered machine, with no noticeable performance hit while running audio applications. At this time KDE is Studio To Go's only choice for desktop/window manager, but the developers may add a single lighter-weight alternative. Studio To Go exploits KDE nicely, and switching to another desktop or window manager will involve engineering a whole new set of integrations. I consider the system's focus on Rosegarden to be double-plus good. Rosegarden 1.4 is a major release that provides even more capability to the distribution, including support for more recent versions of LilyPond and even tighter interapplication syncronization via JACK and MIDI. Placing Rosegarden at the center of an audio-optimized Linux distribution just seems like a very sensible thing to do, especially when the same people design both projects. Performance was excellent. Connections were easily made, recording in Rosegarden and Ardour was simple and direct, and no xruns were reported during my recording and playback tests. Every program I tried worked, and lots of example files are provided for checking out the variety of included sound and music applications. I would definitely recommend Studio To Go for a newbie's introduction to Linux and its audio/MIDI software, but experienced users should also enjoy Studio To Go's many virtues. The Fervent Software team includes some of the most talented and experienced members of the Linux audio development world, and they are devoted to improving their products. Studio To Go 2.0 is on the horizon, and Rosegarden 1.4 is available now. See the Web page for details, download the demo, get the party started.